In the mid-1980s, Marvel fans were treated to an amazing universe-wide story known as Marvel’s Secret Wars. This was a 12 issue series that featured everyone from Captain America to Spider-Man to the Fantastic Four to the X-Men. And of course, it featured everyone’s favorite villains like Dr. Doom, Magneto, Klaw and Kang. 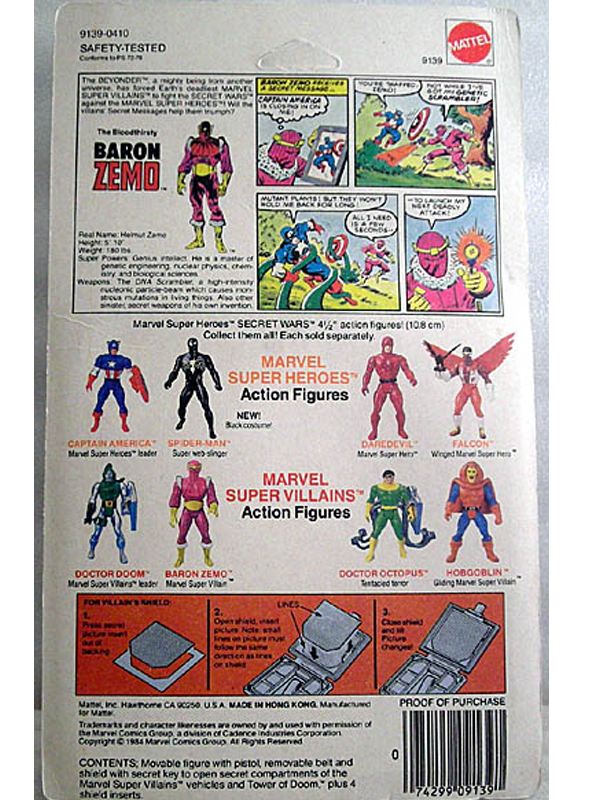 Like any good company in the 80s, Marvel popped out a series of action figures to go along with it. 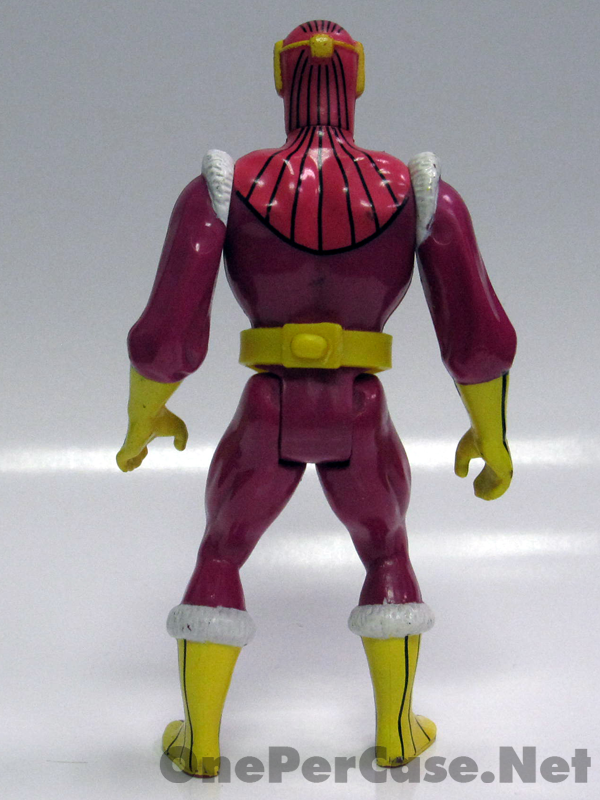 Baron Zemo made it into the series. 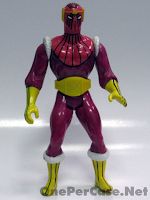 One day when I was much younger and my toy budget was far more limited, I walked into King Norman’s Kingdom of Toys, and I was greeted by Secret Wars figures. The packaging, while nothing too fancy, was enough to catch my eye. At the time, I didn’t know much about Marvel villains, but I loved the look of Baron Zemo. I happily handed over my $5 (and even got change back!) and was on my merry way. 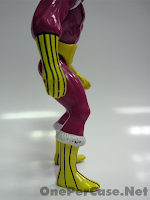 Looking back, it’s amazing to see how much progress has been made in 3 ¾” scale action figures. 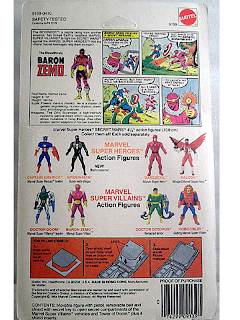 For the time, Baron Zemo was on par with most figures out there. G.I. Joe certainly had him beat on articulation, and possibly sculpt too, but the Secret Wars figures were certainly on par with Star Wars of the time. 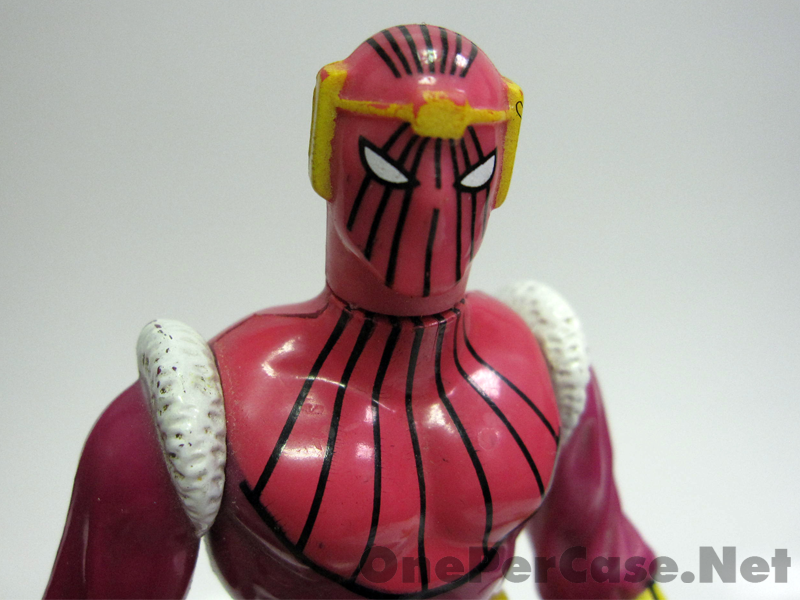 The colors on Baron Zemo really pop out as different from other figures. 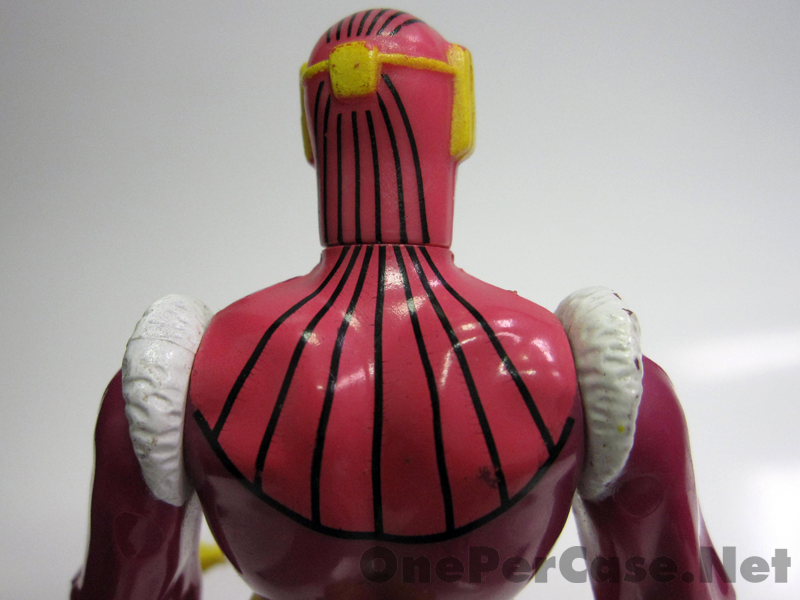 Really, how many figures aimed at boys feature this much pink and fuchsia? Like the other figures in the line, Baron Zemo came with a shield that held an assortment of lenticular images that changed when you moved them. As a kid, I loved gimmicks like that. I’m still not opposed to them. 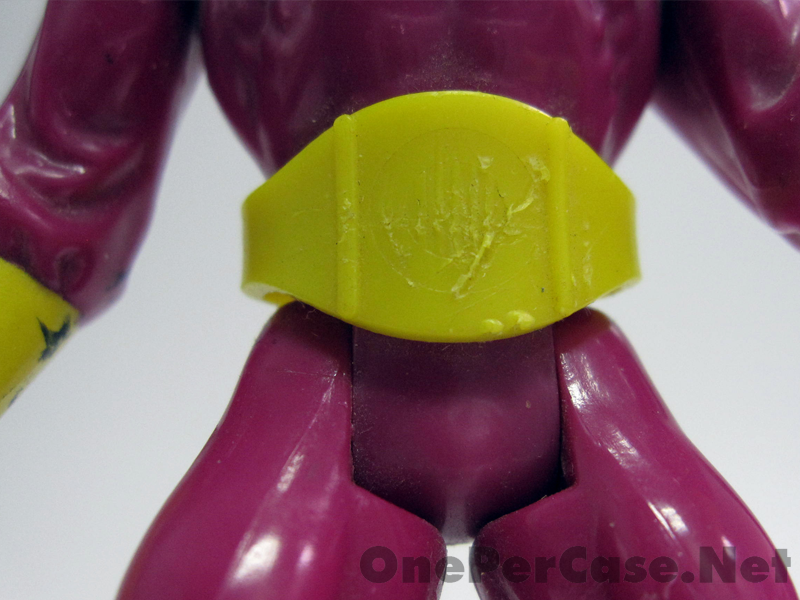 In addition, Zemo came with a blaster pistol and a bright yellow belt. 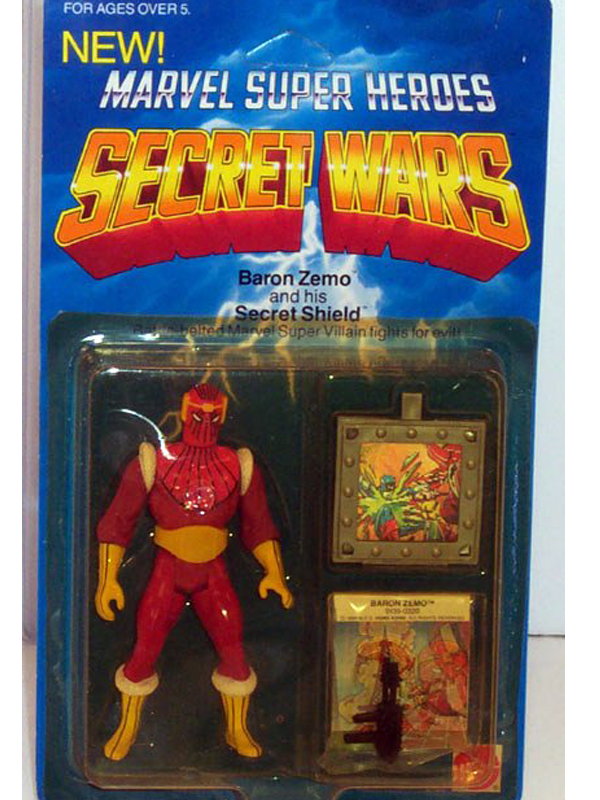 Unfortunately, the gun and shield have disappeared throughout the years, but that belt still hangs around Zemo’s waist like a WWF champ. What can I say? I loved this figure as a kid, and I still think he looks great. 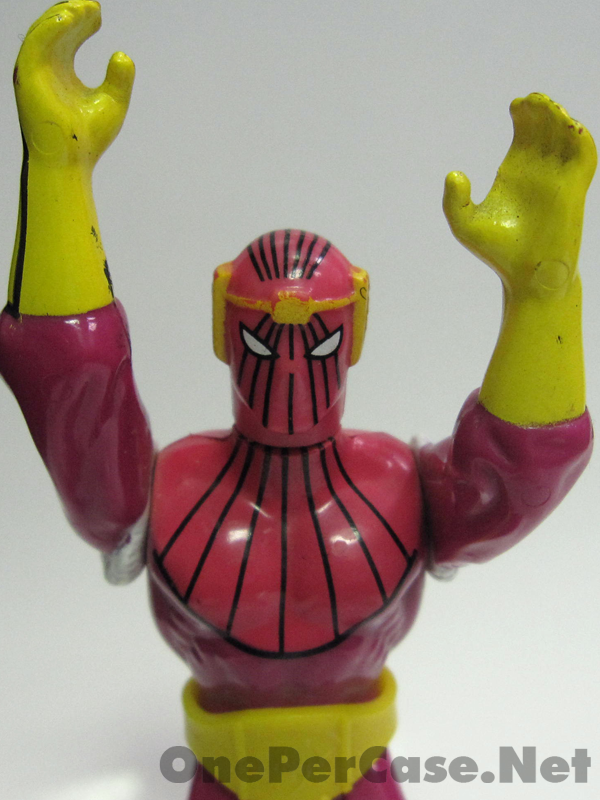 I was disappointed we never got this guy in the Marvel Universe Secret Wars two-packs. Hasbro, if you’re reading this, it’s time already. 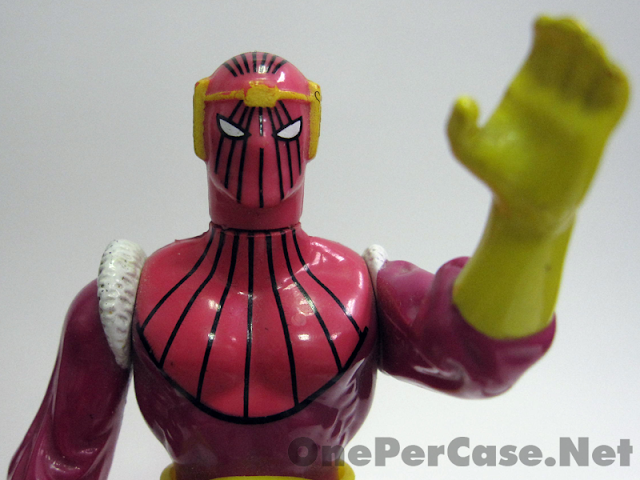 Give me my Baron Zemo! I wonder how many kids mistook this as a weird Spider-man? 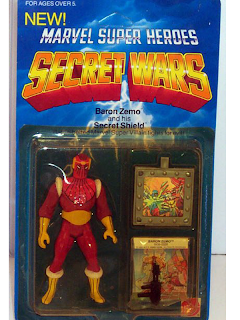 Gotta agree, I'm kind of amazed and disappointed we didn't get an updated version of this guy in the Secret Wars comic packs. I think he's a cool and fairly unique design. Maybe that's why Hasbro didn't put him in the Secret Wars comic packs. Too many new parts. I can't think of anyone else that has a fur lined coat. But then again, we're getting Kraven, so who knows. Well, we did get a decent amount of new (at the time) tooling in those packs. 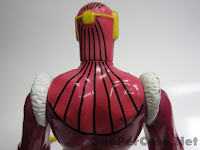 Maybe Hasbro just has an aversion to pink and fuchsia colored male figures? Either way, this guy is sorely missing from MU.